To play the game you will need the wooden pieces and banknotes from Imperial. Europe in the age of imperialism. International investors try to achieve the greatest influence in Europe. With their bonds, they control the politics of the six imperial nations: Austria-Hungary, Italy, France, Great Britain, the German Empire, and Russia. The nations erect factories, build fleets, and deploy armies. The investors watch as their nations expand, wage wars, levy taxes, and collect the proceeds. Since the European nations are under the shifting influence of different investors, new strategic alliances and conflicts arise between them again and again! Each player represents an international investor. Only he who succeeds in increasing his capital and gaining influence in the most powerful European nations will win the imperial competition. 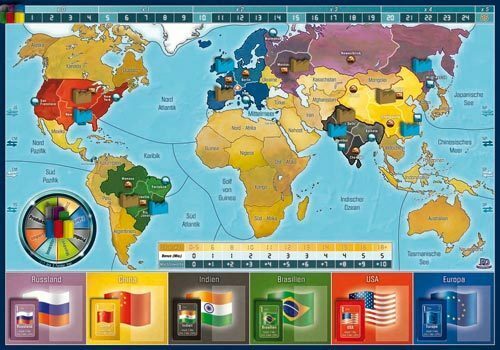 Imperial is a varied strategy game without the luck of dice or cards. 2007 Empfehlungsliste Spiel des Jahres.